Michael graduated from San Antonio’s Alamo Heights High School, the University of Texas at Austin Business Honors Program and the University of Texas School of Law. During Law School, Michael was awarded an academic scholarship and earned the Dean’s Achievement Award for highest marks in Legal Research and Writing. Prior to Law School, Michael worked as a financial analyst for a Houston Mergers and Acquisitions firm. Michael is a frequent lecturer to Credit Unions on the topics such as TRID, home equity lending and resolving probate issues. 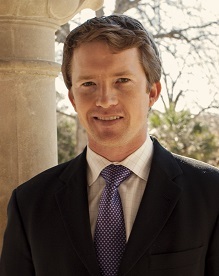 Michael is currently serving on the State Bar of Texas Real Estate Forms Committee. Michael co-authored Issues in Home Equity Lending, which was published by the State Bar of Texas, Advanced Real Estate Law Conference in 2015. Michael was named a Best SA Lawyer in 2017 and 2018 and a “Rising Star” in 2016 and 2017 by San Antonio Scene magazine.